One of the more popular effects used in professionally-produced videos is the split-screen effect. It will essentially split your screen into two parts either vertically or horizontally – with a different video playing in each of the parts. With this effect, you will be able to show two different scenes simultaneously – which not only looks impressive, but can also be very practical when you’re trying to show the audience two things at once. Click on ‘Add Media Files’ and select both the videos that you want to use in your split-screen video. Locate the videos that would have been automatically added to the ‘Timeline’ and drag one of the videos upwards until an ‘Overlay’ track appears and drop it there. Double click the video in the ‘Overlay’ track to enter the editing mode. Open up the list right above the ‘Preview’ window and select ‘Side by side’ to add the split-screen video effect. Select one of the buttons next to the list to determine where the video in the lower ‘Main’ video track will play (the video in the ‘Overlay’ track will play on the opposite side). When you’re satisfied click ‘Apply’ to finalize it, and then ‘Export’ to save your video. The only other thing you may have to do is mute the audio from one of the videos that you’ve added so that both don’t play at the same time. In fact, you may want to even mute the audio from both videos and then add your own audio track. 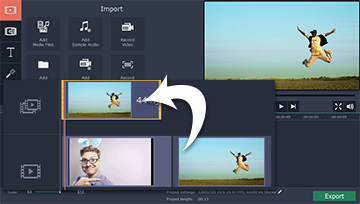 While you’re at it you should also consider using the other features in Movavi Video Editor to cut and combine video segments, apply filters and other special effects, improve the video quality, add customizable text, or transform the videos orientation. The fact that Movavi Video Editor makes it so easy and straightforward to edit your videos should allow you to make full use of its potential. Even if it is your first time attempting to edit videos, you’ll quickly be able to perform the tweaks and alterations that you need to.